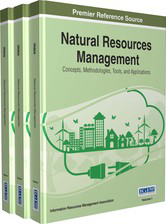 Natural Resources Management: Concepts, Methodologies, Tools, and Applications emphasizes the importance of land, soil, water, foliage, and wildlife conservation efforts and management. Focusing on sustainability solutions and methods for preserving the natural environment, this critical research work is a comprehensive resource for the field of natural resource preservation and management. Chapter 58: U.S. Public Support to Climate Change Initiatives? Chapter 61: Are Climate Change Adaptation Policies a Game Changer? Chapter 70: How Does Public Attention Influence Natural Gas Price?